The Dent Schoolhouse is the SCARIEST haunted house in Cincinnati, OH and known as one of the best haunted attractions in the nation! 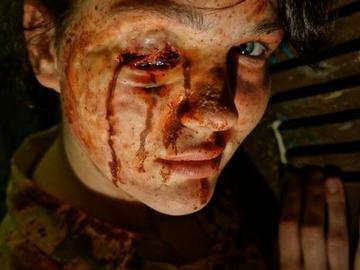 Come experience award winning make-up, movie like scenes and special effects, plus relive the horror movie that is the story of the murderour Janitor! Dent runs September 11th-November 13th of 2015! PLEASE NOTE THE FOLLOWING DATES AND HOURS OF OPERATION FOR THE DENT SCHOOLHOUSE 2015. TICKETS PURCHASED ONLINE MAY BE REDEEMED ONE TIME EACH, ON ANY DATE THAT THE SCHOOLHOUSE IS OPEN FOR BUSINESS. PLEASE PRINT AND BRING YOUR E-TICKET WITH YOU. November 6th - 7th (Fri - Sat) - Lights OUT! Online tickets only! Must be redeemed for the date and time purchased on the ticket. NO refunds!! !